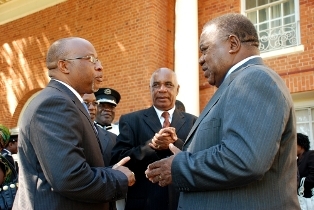 MMD leader Nevers Mumba has disputed a statement by former president Rupiah Banda that he, Banda, has been endorsed as candidate for former ruling party. Mumba says as far as he is concerned, he is the party’s candidate in the forthcoming presidential by-election. “I’m not aware of such a decision,” he said, adding that the Sunday meeting, which he chaired, did not vote for Banda. “Constitutionally, I am the president of MMD and I will stand as the presidential candidate,” he said. Banda, who holds no position in the party, said 19 out of 23 top MMD officials plumped for him as the party’s candidate at a meeting on Sunday. “We have very little time for campaigns and all genuine MMD members should support this decision,” he said. Banda, who is also 77, on Monday announced that a committee of the opposition Movement for Multiparty Democracy (MMD) had elected him as its candidate for the vote expected in January.